When Joba Chamberlain became a free agent, he put pleasing his son ahead of taking a bigger paycheck. LAKELAND, Fla. — One of the big stories in hockey Monday was the letter 11-year-old Jordyn Leopold wrote to the Minnesota Wild coaches asking them to acquire her father, Jordan, from the Columbus Blue Jackets and bring him home to Minnesota. Jordyn never sent the letter but got her wish anyway when the teams made a trade before Monday’s NHL trade deadline. 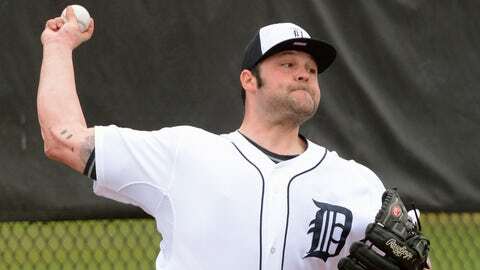 The story of how right-hander Joba Chamberlain returned to the Detroit Tigers in free agency is not quite as poignant, but it’s touching nonetheless. Chamberlain, 29, said he chose the Tigers in part to honor the wishes of his son, Karter, 8. “I sat down with Karter and asked him what he was comfortable with,” Chamberlain said recently. “He’s old enough to know. He has been around this game his entire life. I felt I could sit down and talk to him. He understands what’s going on and what goes into it. Victor Martinez, the Tigers’ designated hitter, is coming off knee surgery. His son, Victor Jose, 10, is the ebullient, charismatic kid who became a favorite of manager Terry Francona’s when both Martinez and Francona were with the Red Sox. Chamberlain did not sign until Feb. 24, and he received a relatively paltry one-year, $1 million deal. He said he had interest from the Rangers, Dodgers, Royals and Brewers and that a “couple” of those teams offered salaries comparable to the $2.5 million he made last season. But he never gave up on rejoining the Tigers. The way Chamberlain described it, he had something to prove personally after his poor second half and postseason, and the team had unfinished business after getting swept by the Orioles in the Division Series. Karter, who lives with his mother, Alicia, in Lincoln, Neb., was part of the equation, too. Chamberlain spends considerable time with him in the offseason, and Karter also is a frequent visitor during the season. “At the end of the day, he was probably that little birdie who sits on your shoulder, doesn’t really say anything, but says a lot,” Chamberlain said. “He said he loves it here. He has friends here. That’s the greatest part about it. They get to grow up together and hang out. It’s just nice to see the boys on the field playing. “It was always in the back of my mind to come back and continue doing what we did last year. The end of the year left a sour taste in all of our mouths. All of us want to come back and finish even stronger."